Last summer Colorverse Ink Company released a Tokyo special edition ink color set, Hayabusa and Hayabusa Glistening. These two new inks are based upon the Japanese robotic space mission from 2003 through 2010. The name Hayabusa in Japanese means Falcon. Colorverse Hayabusa ink is a wonderful vibrant purple color that pops on the page. Colorverse Hayabusa ink produces nice color variation and even a small amount of green sheen with a wetter line. Although Colorverse usually releases inks in “seasons” of colors, and are currently in Season 5 the Red Planet, they periodically have special edition colors that only available for a limited time. Hayabusa is one of these special edition colors. As with each package of ink, Colorverse includes two bottles, a larger 65 ml. bottle of the regular Hayabusa purple colored ink as well as a smaller 15 ml. 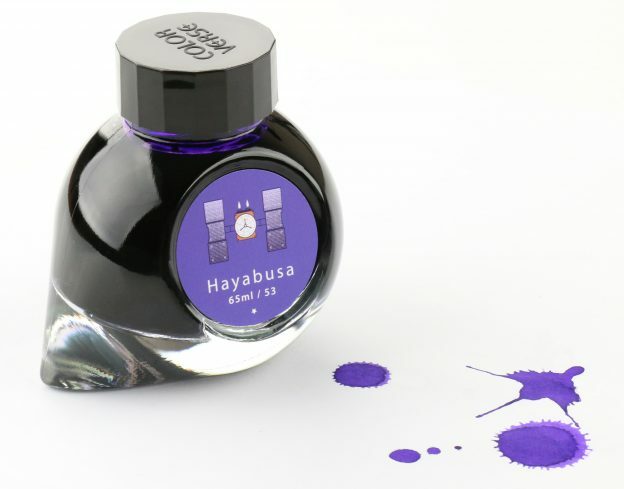 bottle of Hayabusa Glistening ink, the same purple base color with metallic shimmering flecks within the ink. The combination of basic purple ink, as well as a shimmering version, allows for many possible uses and projects with these beautiful purple colored inks. Continuing reading for a chance to win the bottle of Colorverse Hayabusa Ink we used for this review. 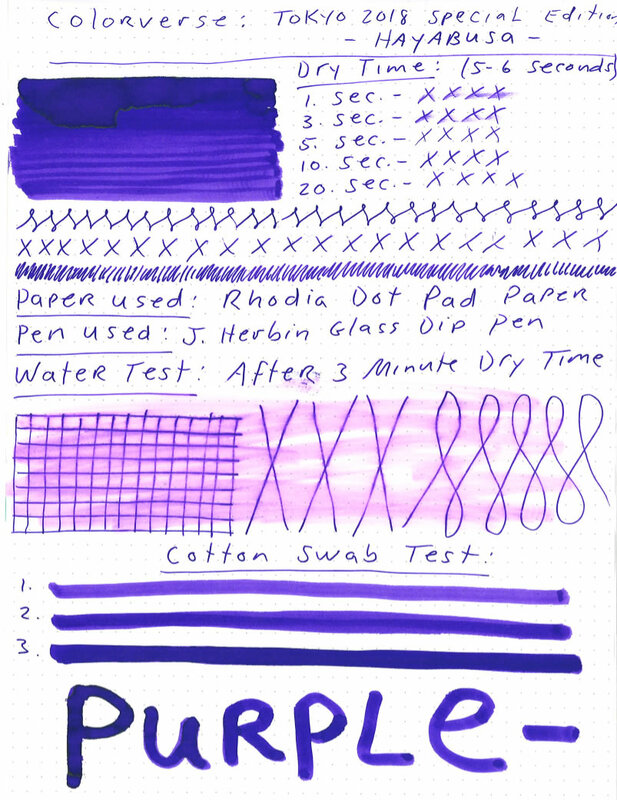 For our review of Colorverse Hayabusa ink, we used a J. Herbin glass dip pen on Rhodia dot pad paper. Different pen types, nib sizes, and paper may produce different results. Colorverse Hayabusa ink comes in Colorverse’s standard yet unique 65 ml. ink bottle. The large capacity ink-bottle has a nub protruding from one side like the tail of a comet. Each box of Colorverse Hayabusa ink also comes with a complimentary 15 ml. bottle of Hayabusa Glistening ink as well. Colorverse inks come well packaged with various ink “swag” such as stickers and pen wipe. Colorverse Hayabusa ink retails for $36.00, but can be found at a discount on our site. This makes Colorverse Hayabusa ink a high mid-ranged priced ink, but quite reasonable due to the amount of ink you receive, the uniqueness of the bottle and the fact that you actually get two bottles on ink, imported directly from Korea. We found a fairly quick dry time of 5-6 seconds during our review of Colorverse Hayabusa ink. Again a different nib, writing style, and paper may produce different results. Colorverse Hayabusa ink is a medium saturation ink and found no bleeding at all during normal use. However, during our cotton swab test, we did notice some bleeding at the wettest point of the test. During normal use, we found no feathering while testing Colorverse Hayabusa ink. During our water test, we only found a slight amount of additional feathering. During our review of Colorverse Hayabusa ink, we conducted a water test on a dried ink sample. Our results showed significant color smearing, which is not unusual for a non-waterproof ink, but very little additional feathering. The lines remained quite distinct and legible. Colorverse Hayabusa ink will produce some nice shading depending on your writing style and fountain pen nib used. Color variation may be a dark deep purple to a light vibrant purple with a possible hint of green sheen. Colorverse Hayabusa ink is a nice dark to vibrant purple color of ink. This 2018 Tokyo Special Edition has a quick dry time, will shade and even sheen a bit. It comes with a complimentary 15ml. bottle of Hayabusa glistening ink as well, which makes the price very reasonable for this imported ink. Happy writing from Korea! This entry was posted in Fountain Pen Ink and tagged Colorverse, fountain pen ink, Giveaway, review on April 2, 2019 by Pen Chalet. Been looking for a purple ink, but haven’t decided on one yet.. This is a very unique purple. Cool name also. if you haven’t yet, I’d like a review of Akkerman inks. Thanks. Well, I have been looking for a “blurple” ink for a while. This one looks nice. And the small bottle would be a nice extra. Wow, that is a beautiful purple and the bottle is lovely too. Very interesting violet to magenta shading in that ink. Purple has been my thing for some 50 years. I’m just beginning to enjoy purple inks and I’d love to try this one. Thanks for the opportunity to win a bottle! I love Colorverse Inks, and I’ve been eyeing this one for a while. It looks more violet than purple until you see the effects of the water, and then the purple shades seem to come out more. Lovely color! My favorite ink is purple! Any and all of them, so I’d love love to win this ink! Looks like a lovely to-the-blue purple. Love purple inks. Thanks for this. Love Colorverse inks and love this color! This looks like beautiful ink in a beautiful bottle. I am just starting to try different inks. I have only used the basic ones up to now. Absolutely Stunning Colour!! I pray I’m blessed & win this one! God Bless & the Love of Christ to you all!! This is one of my favorite inks!! I love purple! One can never have too many purple inks right? I like Robert Oster Sydney Lavender as my latest favorite. This looks like a beautiful shade of ink too.